After three long months without a proper kitchen, 400 tea bags, industrial quantities of chocolate hobnobs and a daily battle with dust the builders have finally left. At last I can cook again and like any addict denied their fix I am overdosing at ever turn. Cakes for the village shop- of course, friends for the the weekend, why not? And as a huge thank you for all our lovely neighbours who took us in and fed us when we were staring ready meals in the face we are having a gang of them over this week for a kitchen supper washed down with a few glasses of wine. Over the next few blogs I plan to share the recipes for the meal with you and today it’s the starter. 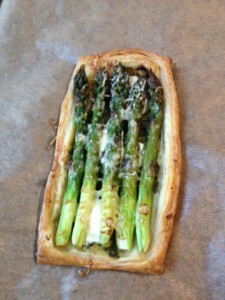 With piles of fabulous local asparagus now in abundance this tart seemed like a no brainer. No eggs or cream, just a puffy pillow of a tart that can be assembled ahead and slipped into the oven while our guests enjoy a glass of fizz. I don’t want you to think I’m showing off but I made the pesto that I smeared under the spears with the wild garlic that grows in profusion around the local riverbanks and it’s not too late to make some for yourself if you are quick. If that’s not an option a bought pesto will do just fine. Happy days. Snap each asparagus spear, it will break where the base becomes woody. 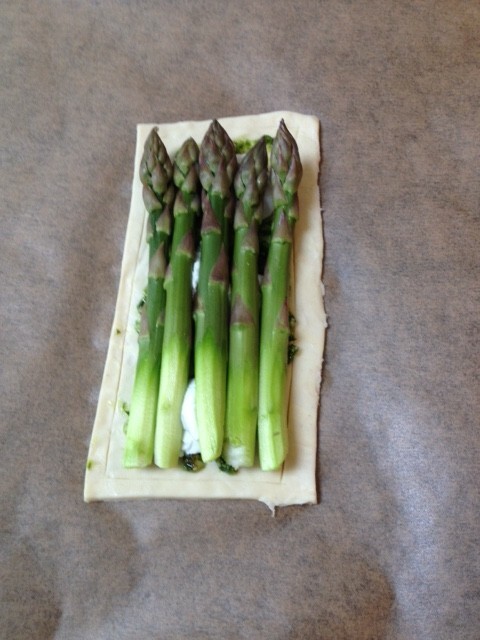 Peel the end of each spear.Line 2 baking sheets with baking paper. 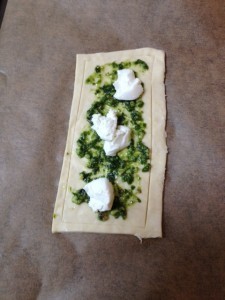 Unroll the pastry and cut into four oblongs about 10cm by 5cm. 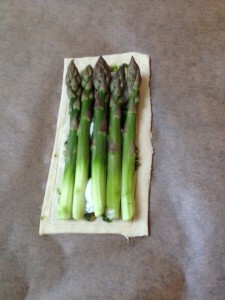 They need to be a bit larger than the trimmed asparagus and wide enough to take 5 spears with a small margin. Put the pastry oblongs on the baking sheets and mark a line around each about 1cm in from the edges using the point of a sharp knife. 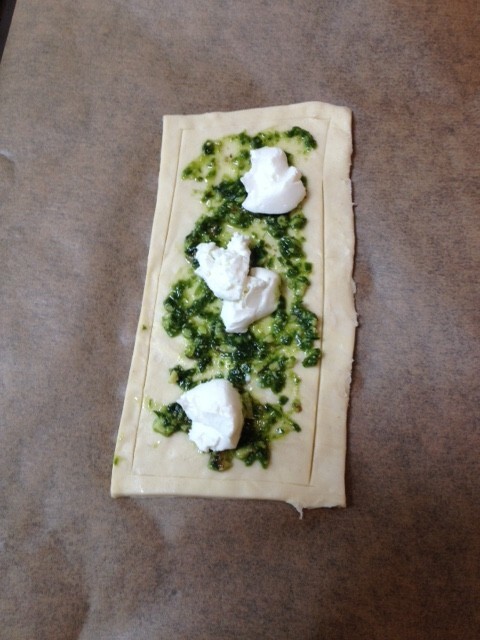 Spread with pesto inside the marked lines and spoon over a few blobs of cheese. Snuggle 5 asparagus spears over each. 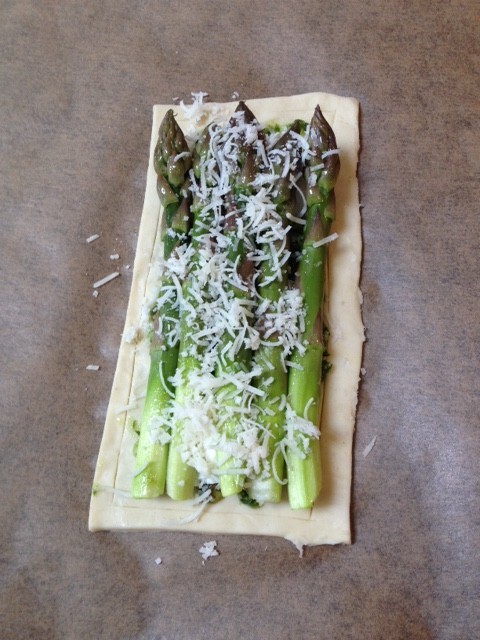 Brush lightly with olive oil and season with salt and pepper. 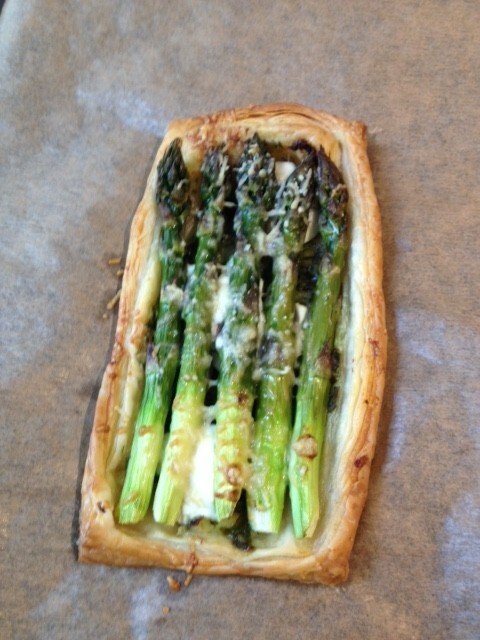 Sprinkle with parmesan and bake for 20-25 mins until the pastry is crisp and golden and the asparagus is tender. 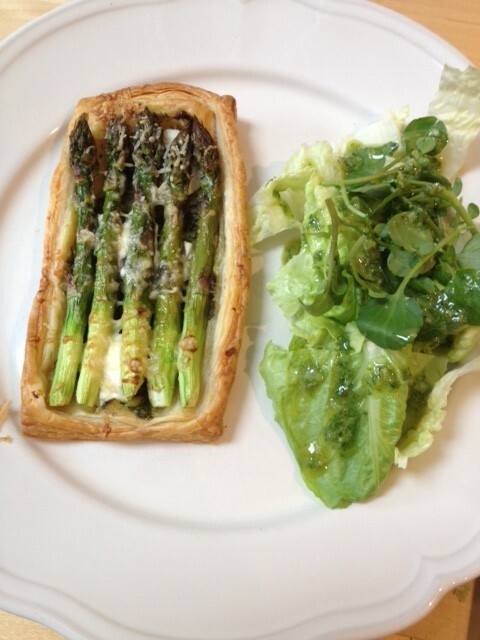 This entry was posted in starters, veggie and tagged asparagus, kitchen, pastry, pesto, spring, tarts, village shop on 10th May 2016 by marycadogan.